The barrel curls are created at the upper centre and secured with pin underneath of each loop. 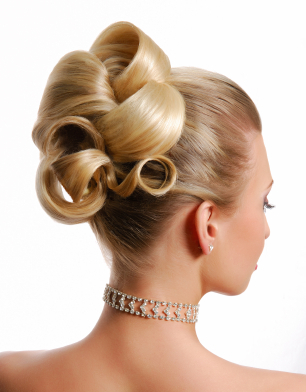 This hairstyle could be exceptionally elegant and can be adapted to suit most face shapes. If decide to use accessories, make sure not to let details take over the entire look; make them part of your hair and keep them simple and subtle. When it comes to your wedding hairstyle, the way you imagine the hair to be and what might actually suits you and your hair type may be two entirely different things. So plan and consult your hairdresser in good time and try as many styles as you can before the big day.